Unless you have been living in a remote cave I am sure you have heard the reports that 2015 was the warmest year on record. In fact December was globally the warmest calendar month in 136 years of weather history. For anyone who wants to read more on this, Jeff Master's blog at Weather Underground is an excellent summary. In Florida the weather was only marginally cool enough to camp a few days in November and December when it is usually ideal weather to sit around a campfire and sleep in a tent. In mid-December I had heard that the water level was high enough to allow easy paddling up to Lake Norris. This had long been on my kayaking to-do list, so I enjoyed a beautiful Sunday on the water paddling upstream on Blackwater Creek, winding through the cypress swamp then all the way around Lake Norris and back. This scenic water body in Lake County is similar in appearance to Lake Disston in Flagler Co (see my October post) and Blue Cypress Lake in Indian River County. 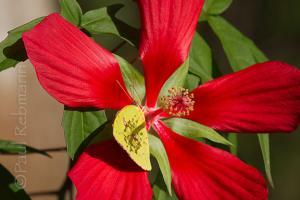 I was surprised to come across several scarlet hibiscus flowers along the edge of Lake Norris. It is not that this is an unusual place to see them because it is not. In fact, the best way to see this magnificent native wildflower is by boat, as it favors the wet edges of streams and ponds. But it is a summer or early fall bloomer, with flowers most often seen in July and August in this area. During the Christmas bird count, our team noticed a few anomalies with the types and numbers of birds seen, including a low count of robins, which in a more typical year would have been driven here in large numbers by cold weather. While out canvasing birds we saw several out-of season flowers. The azaleas might not be that unusual, as they do tend to flower sporadically during even slightly mild winters earlier than their more typical late February blooms. But the big surprise were the southern magnolia flowers, which would normally be seen from late spring into early summer. These untimely floral phenomena might be just a observational curiosity. It is unlikely - as can often happen farther north when plants bud and flower too early - that freezes will significantly harm the coming year's normal plant cycles. But as a fellow naturalist pointed out the other day, the last time there was a winter similar to this was 1997-1998. That was during an El Niño event, one that up until then was the strongest in history but surpassed by the current cycle. The warm and wet winter promoted a lot of unseasonable growth. Followed by a shift to a La Niña weather pattern that brought a dry spring and summer, making all that extra growth prime fuel for the most devastating wildfire season Florida had ever experienced. Each El Niño and La Niña period do not necessarily duplicate the resulting weather of previous events, but many of the factors that influence the weather in various areas can tend to be similar. Hopefully weather history will not repeat itself and that the increase in prescribed burns in the intervening years has helped lower the fuel load in many of Florida's natural areas and therefore make any wildfires that do occur more manageable.